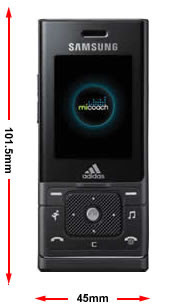 Feature: This is one of the stylish mobile phone in mobile market. Among all it’s quality the pedometer and the heartbeat screen the most important. This stylish looking slider phone is equipped with a range of multimedia capabilities such as a highly developed music player, an integrated mega pixel camera and embedded games. The users can tune in to the FM radio for the latest updates on music, news, weather, and sports. Special Feature: pedometer and the heartbeat screen, a highly developed music player.